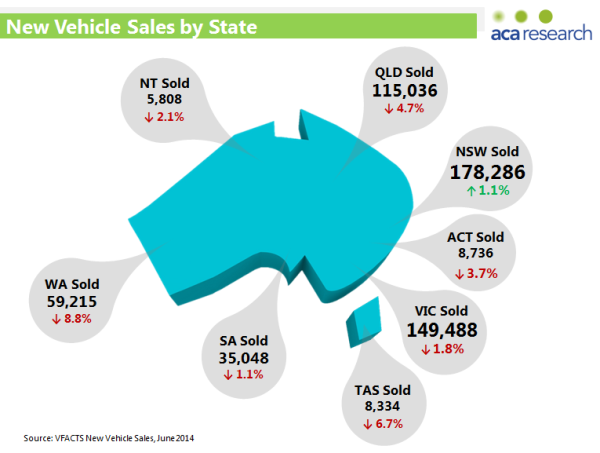 VFACTS data has been released showing vehicle sales for the first 6 months of 2014, so it’s time for a half-time auto market report analysing the key trends. Looking at the market as a whole, sales in the first half of the year are slightly lower than the mid-point for 2013. 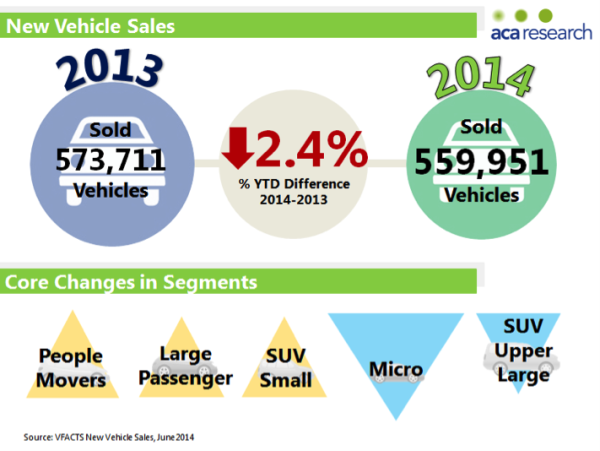 559,951 new vehicles were sold by the end of June 2014, down 2.4% on the same period in 2013. A two speed market is apparent. Sales to private buyers and to Government agencies are up 2.2% and 6% respectively, but demand from businesses is still weak with sales down 8.9%. The sharpest decline in business sales is in the light commercial and SUV segments, down 13% and 12.7% respectively. There is also considerable variance by state. Sales in NSW are up 1.1% but down 4.7% in QLD and down 8.8% in WA. Much of this decline is to be related to the slowdown in the mining and natural resources sector. 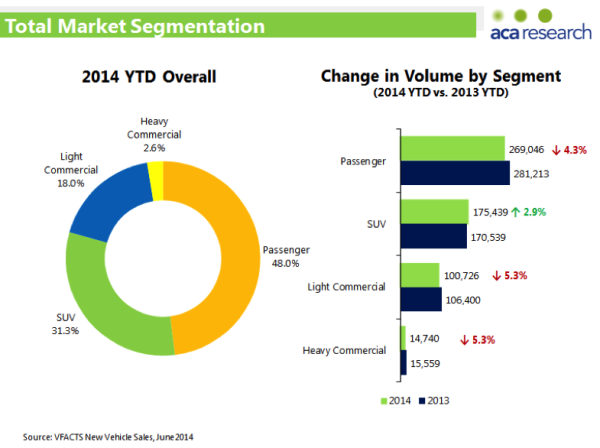 Looking at trends in the private buyer market, sales of passenger cars are down 5.6%. While in contrast to the business sector, sales of SUVs and light commercial vehicles are up 14.2% and 6.1% respectively, which demonstrates Australia’s ongoing love affair with SUVs and recreational Utes. Within the passenger vehicle segment, sales of large passenger vehicles are up 15% YTD, but this increase is simply down to the stellar mid-year results for the Holden Commodore sales of which have increased by 58.8%. Total sales of Micro passenger vehicles are down 33% YTD, but Fiat is bucking the trend with sales of its Fiat 500 increasing by 142%. 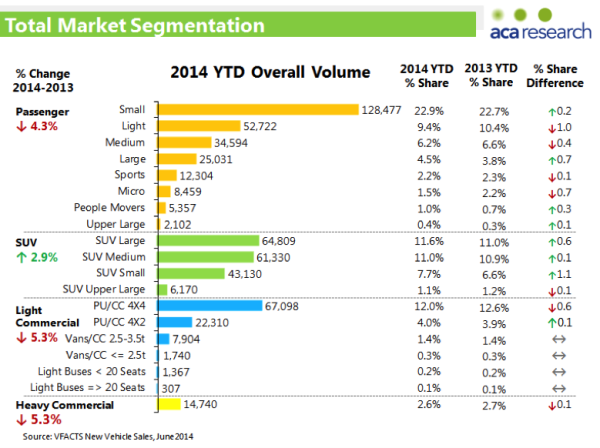 The small car segment continues to have the largest volume of sales in Australia. The Mazda 3 and Toyota Corolla are still leading the charge. 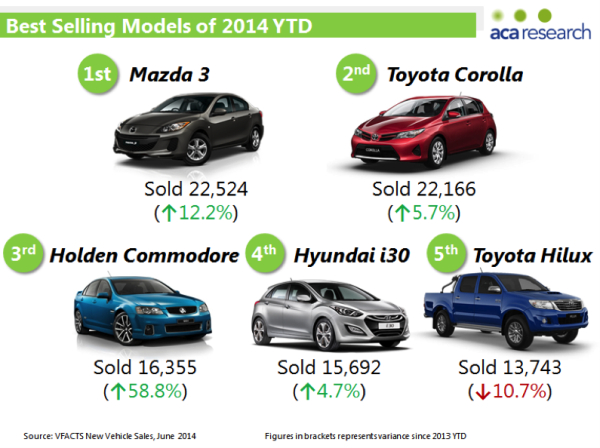 Despite being slighlty behind in total, the impetus is with the Corolla which outsold the Mazda 3 by 589 units in June. In the battle of the brands, Toyota continues to dominate the Australia market with 18% market share. Holden, Hyundai and Mazda are battling it out for second place, with Hyundai up 3.4% from a year ago and Holden up 10.1%. Nissan had another poor month in June with sales down 24.8% YTD. 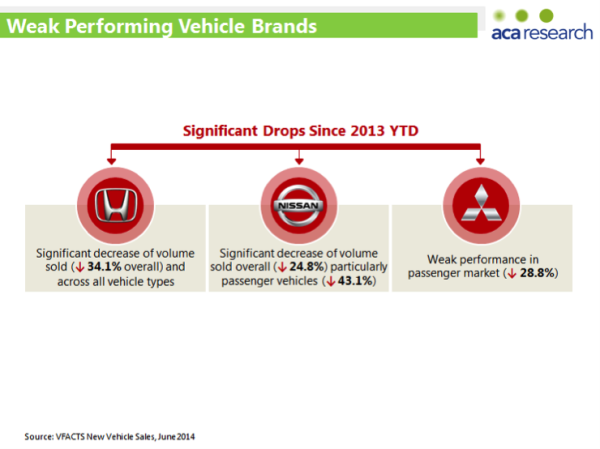 Finally, a notable mention should be made of Jeep’s performance, with sales up 43%. The new 2014 Grand Cherokee is contributing the most to Jeep’s success. The success of Jeep has also been a contributory factor in the USA as it overtakes England in the country of origin league table. 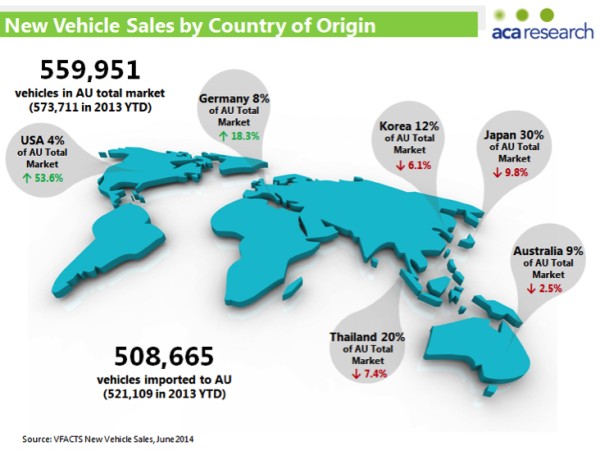 Australian manufactured cars account for less than 10% of all vehicles sold this year. 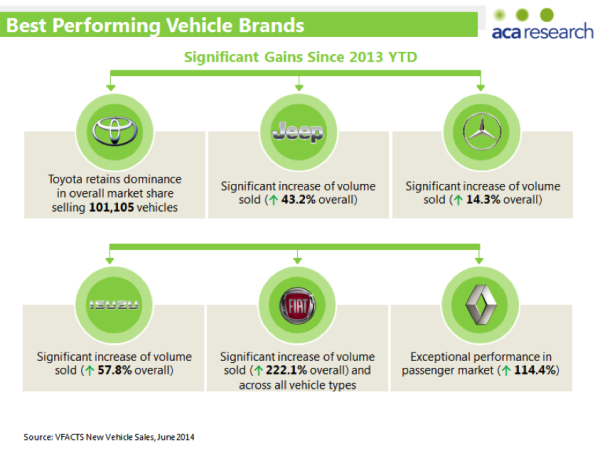 ACA Research regularly monitors the Australian automotive industry and collates and compiles vehicle market research from various sources, including industry bodies, government statistics and trade reports. Please contact us if you would be interested in arranging a meeting to discuss your research needs further. Or subscribe to our monthly newsletter, In The Headlights, for all the latest automotive research and insights. 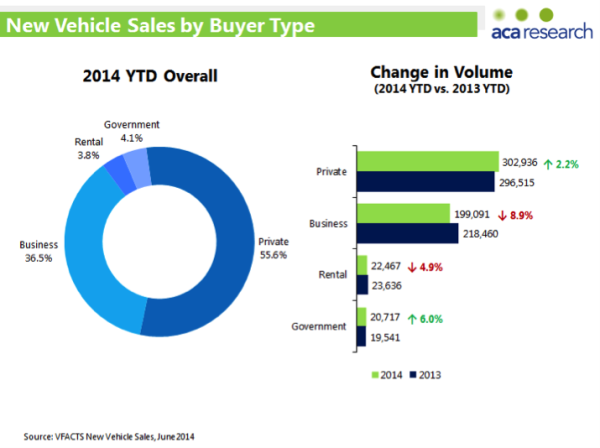 If you'd like to view the VFACTS sales data for all of 2014 click here.